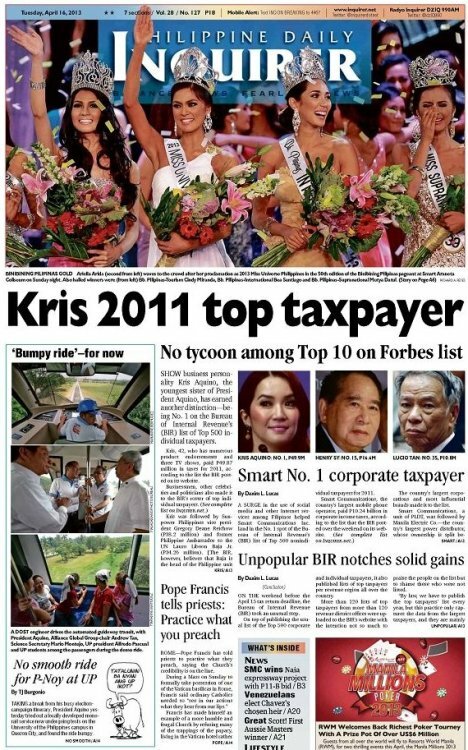 Philippine Daily Inquirer: You Got Trolled! It was no surprise that for most of us who have been religiously following the happenings on the cyber world (half of which are journalists and the other half are bored individuals like me) – whether it be on Twitter, Facebook, or Tumblr – that President Aquino made it to this year’s list of TIME Magazine’s 100 Most Influential People in the World. The news came last April 18 at 7:03 PM, Manila time. In response, President Noynoy Aquino said that he was merely the “face” of the Filipino people, that the recognition is due to his countrymen and of the whole country and that if success was achieved, it would be the success of everyone. As most of you know, I have always been fascinated with covers and front pages of various local and international broadsheets and magazines. In fact, it is my daily habit before starting a day’s work to browse and to look at various front pages and covers whether it be in print or in digital format. I consider it as an exceptional art and as a part of history as well. So when the list came out, I eagerly waited on who would be on the cover of TIME’s special issue. An hour past midnight earlier, while waiting for the developments on the manhunt of the marathon bombing suspect in Boston (and while waiting for my ‘Homeland’ episode download to finish), I dropped by the website of the Philippine Daily Inquirer to see if they have already uploaded their page one for today. 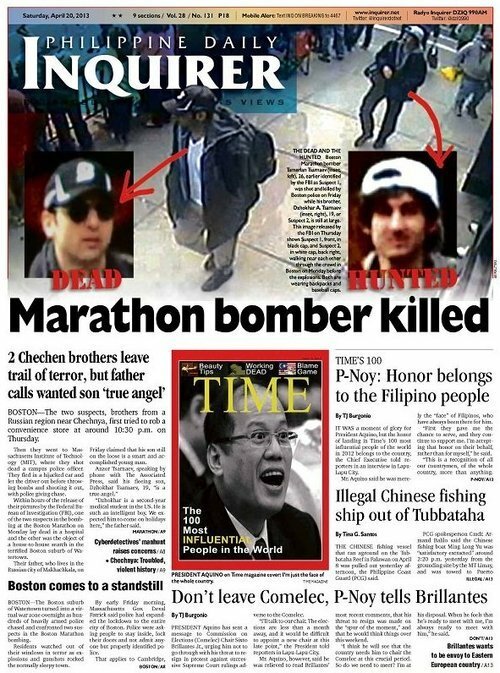 As I looked at the digital format of the front page, aside from the photos of the two Boston bombing suspects, I saw the photo of President Aquino in an apparently, a cover of TIME Magazine’s 100 Most Influential People in the World. But here’s the catch: The cover looked fake and the photo of President Aquino that was used was one of his, excuse me, unflattering photos. I immediately searched TIME magazine to verify its authenticity and lo and behold, it turned out to be fake. The cover for this year’s special issue is Jennifer Lawrence. Not President Aquino. I have a love-hate relationship with that broadsheet. Though I have repeatedly praised some of their creative front pages (like the false cover and the bloodied cover for the Philippine Independence Day celebration), I have also criticized (if not make fun of) some of them. to name a few, there was the juxtaposition failure, their tabloid-esque layout, and the headline that’s more appropriate in the entertainment section. It has been a buzz in the social media that the Inquirer is “too yellow”, a broadsheet that is always in favor of President Aquino. In fact, my (new) favorite blog, The Spin Busters, describe the Inquirer (or PDI) as thePresident’s Daily Inquirer. The Inquirer later apologized in a tweet saying that it was an honest mistake. But here’s the catch, they also said that they wish it was President Aquino on the cover. With that being said, I think it is evident that there is no statement “more yellow” than that. I once worked for the publishing industry and it is a mortal sin among us to run and print non-factual information and materials. Though my previous job is not that of the news industry (I worked for a private company publishing textbooks), this broadsheet, In my opinion, with their hundreds of employees, should have exercised diligence in publishing their paper. Now that the boo-boo has been published and distributed nationwide, I think this broadsheet has lost a bit of their credibility. That’s the price you pay of falling for a troll’s trap. Going back to President Aquino’s statement that he is the face of the Filipino people, I cannot but take a look again at his unflattering photo. The trolls have successfully used the President’s signature “nganga” image. In the local pop culture, “nganga” – or the act of leaving your mouth wide open – has a connotation of emptiness, laziness, tardiness, and stupidity. If this is the real face of the Filipino people, then we are travelling not in a promised Daang Matuwid. We are in a Ngangang Matuwid.